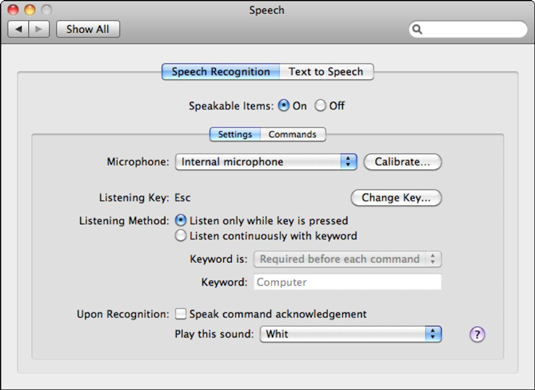 Snow Leopard’s speech settings let you set preferences for how Mac recognizes speech, and what commands it can understand. Not only that, Snow Leopard can read the screen to you. To access Speech Preferences, open System Preferences by clicking the gear icon on the Dock, then navigate to the speech options. Snow Leopard includes highly configurable Speech features. Speech Recognition: This pane has two tabs of its own: Settings and Commands. With Speakable Items toggled on, you can control Snow Leopard with spoken commands. Settings tab: If you have more than one microphone, you can select which one you want to use as well as set the input volume with the Calibrate button. You can change the Listening key (Esc by default) and specify whether your Mac should listen only while the key is pressed or whether the Listening Key toggles listening on and off. Commands tab: Here you can select which types of commands are available as well as whether exact wording of command names is required. Click the self-named button to open the Speakable Items Folder from this pane. The Announce When Alerts are Displayed feature actually speaks the text within alert dialogs; to configure spoken alerts, click the Set Alert Options button. You can optionally add a phrase before the text, which you can choose from the Phrase pop-up menu. To add a phrase to the list, like Don’t Panic!, choose Edit Phrase List from the list. Move the Delay slider to specify how much time your Mac waits before reading the dialog to you. You can also optionally announce when an application wants your attention, and Snow Leopard can speak the text that’s currently selected within an application when you press a key that you specify. This pane also provides a couple of convenient shortcut buttons that take you to other “speech centers” within System Preferences, specifically, the Date & Time and Universal Access panes.